Woodley's Cottage is wonderfully positioned, 400 metres down an unmade lane which is a no-through-way. 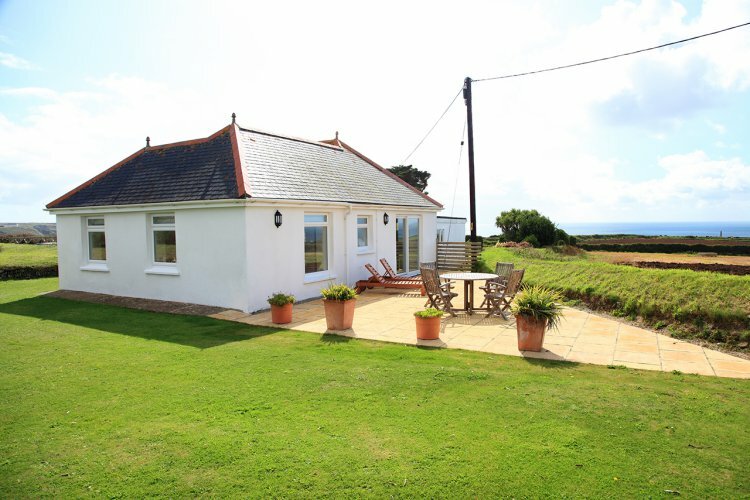 A detached holiday cottage for up to four people with sea views right over Mount's Bay to St Michael's Mount and Gwennap Head in the distance. Just 400 metres from the coast and the wonderful beach at Poldhu Cove with its great surfing, beach cafe and car parking. Cliff top walking is right from the doorstep, either North towards Loe Bar and Porthleven or South passed Mullion towards Lizard Point. Entered from the large driveway into the internal hallway. The light and spacious living area has just been improved with wonderful sliding glass doors giving uninterrupted sea views towards Poldhu Cove and out across Mount's Bay. There is comfortable seating for four people, LCD TV with DVD player, wifi availability and a dining table and four chairs. The sliding doors give access directly onto a large new patio with garden furniture. Woodley's Cottage has been extended, now giving the property a large bright and fully equipped kitchen. Together with electric oven and hob, fridge freezer, microwave, washing machine, tumble dryer, dishwasher and Tassimo Coffee maker. Bedroom one is a dual aspect double room with sea views. With 5' king-size bed, bedside tables and lamps, a wardrobe and a chest of drawers. Bedroom two is a small twin room suitable for one adult or two children, with two x 2'6" single beds (which are narrower than a standard 3' single bed), Bedside table and lamp, and a wardrobe. The family bathroom has a full size bath with mixer shower over and matching handbasin and toilet. Outside is the new patio and lawned garden with sea views and garden furniture provided. The coastal footpath is accessible right from the driveway and Poldhu beach is less than 10 minutes walk away. Mullion, with its pubs and shops is just one mile away and the market town of Helston is just 10 minutes in the car. There is another holiday cottage just up the lane which sleeps 6 - (See 'Marconi's Reach', number 569). Rental includes bedlinen, electricity and towels. Heating is by modern wall-mounted electric radiators. WiFi is provided. Regret no pets and no smoking.